Here you will find all our lovely little drawstring pouches. With their simple opening and closing mechanisms, they are all great for keeping little treasures in. These simple drawstring pouches, known as 'Thaili' in Nepal, are made from off cuts of materials that would have otherwise been discarded. These pouches are cotton lined and have a clever set of drawstrings sewn in, one set to close and the other set to open. All fabrics, colours and patterns vary. Sweet little velvet drawstring pouches for you little treasures, cotton lined with a clever set of drawstrings, these pouches are made from the off cuts of large pieces of fabric. Simple but very effective drawstring pouch for keeping your precious little things in. The material colours and patterns will vary quite a bit between shipments. 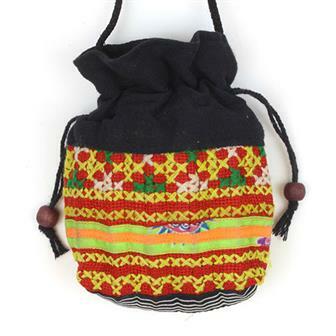 Pretty little purses made in Nepal from traditional Tibetan design fabric. Perfect for keeping all manner of small goods in. Simple pouches made from sari off cuts with drawstring. Due to their recycled nature all patterns, colours and trim varies. Perfect for all your little bits of treasure. 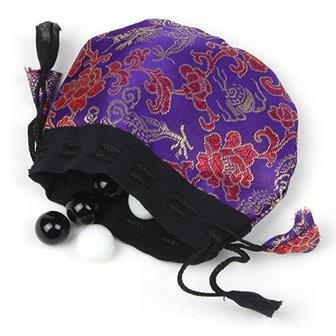 This sturdy lined drawstring pouch has large beads for the drawstring and a long string to hang round the neck so the pouch can be concealed under clothes. The patterns are off cuts of Thai Hill tribe material so designs and colours will vary. 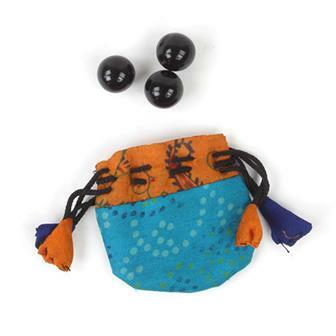 Simple little fabric drawstring pouch made from off cuts from sari materials that would have otherwise been discarded. 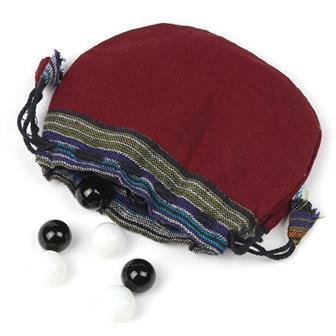 These delightful little pouches are great for smaller items such as rigs and crystals but could be used to store all manner of mini treasures. Due to their recycled nature all patterns, colours and trim varies. Small fabric drawstring pouch made from off cuts of brocade fabric. 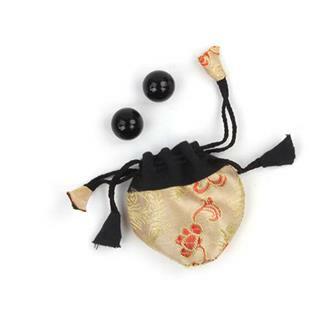 These delightful little pouches are the perfect size for keeping small jewellery. Ideal for rings, keeping earrings in pairs and all manner of other mini treasures. Colours and styles vary from shipment to shipment but often include Indian, Nepalese and Chinese style brocade patterns. 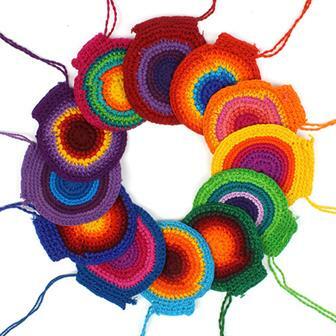 Set of a dozen mini little crochet pouches on drawstrings. The perfect size for small polished stones, crystals or small jewellery. 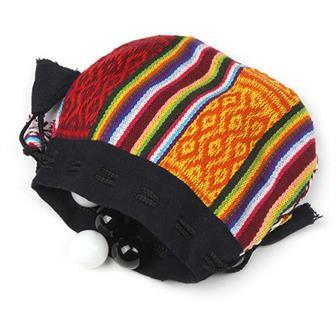 These charming Guatemalan pouches are made in the traditional tapestry crochet style and come in mixed colours and patterns. 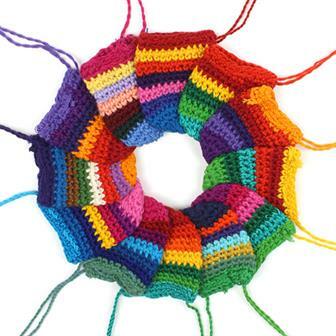 This pack of twelve fantastic bright crochet pouches are made in the traditional tapestry crochet style and come in a mixture of bright colours. They are big enough to hold larger polished stones and crystals or to be used as a coin pouch. 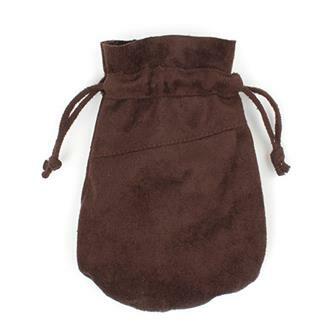 Beautiful and silky, this little drawstring purse opens up to be an ideal place to safely keep your crystals. Inside it has several little crystal pockets sown into the seam to keep them from knocking against each other. The pouch is also suitable for storing any other, similarly sized treasures. 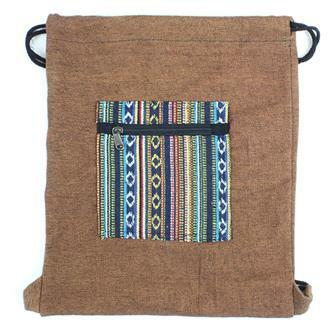 This lovely little drawstring pouch is handmade using a soft suede like material giving it an antique, rustic look. Great for storing little treasures in. 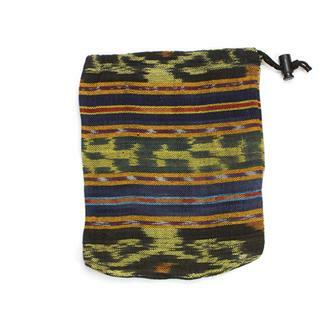 Tough little bag made of traditional Indonesian ikat material. 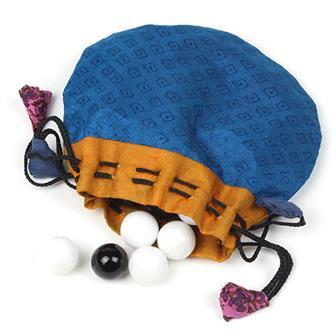 Each bag closes tightly with a strong nylon drawstring and a plastic toggle clasp. Cotton duffel bag made from bold and beautiful bedspread material from India. 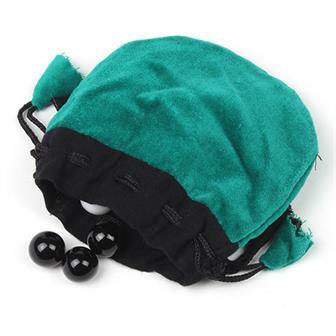 This bag is ideal as a gym bag; easy to stuff and close. Available in a selection of brilliant bright patterns, this generous bag has sturdy straps linked to the drawstring closure. 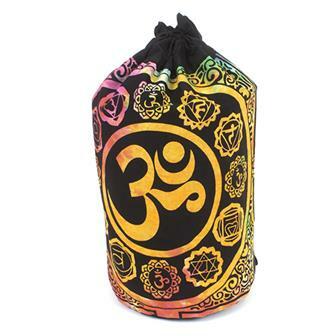 Cotton duffel bag made from bold and beautiful bedspread material from India, featuring an Om surrounded by chakra symbols on rainbow dyed material. This bag is ideal as a gym bag; easy to stuff and close with sturdy straps linked to the drawstring closure. 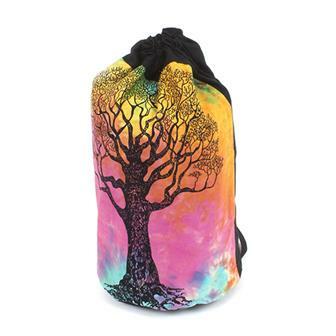 Cotton duffel bag made from bold and beautiful bedspread material from India, featuring an elegant tree design in rich black printed on rainbow dyed material. This bag is ideal as a gym bag; easy to stuff and close with sturdy straps linked to the drawstring closure. 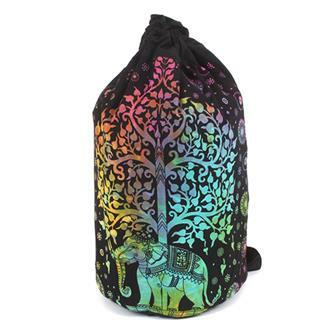 Cotton duffel bag made from bold and beautiful bedspread material from India, featuring a festival elephant under a tree printed in rich black on rainbow dyed material. This bag is ideal as a gym bag; easy to stuff and close with sturdy straps linked to the drawstring closure. 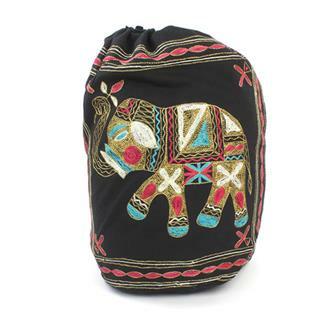 Simple light cotton bag with drawstring straps, embroidered with an elephant design in metallic thread. These easy going, simple drawstring backpacks are perfect for everyday use. Ideal for the gym, school or work; each one features a gheri material pocket on the outside. 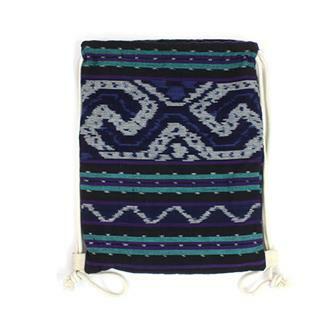 These handy drawstring bags are made from the traditional Indonesian material known as Ikat. The dyeing method used gives them the characteristic blurred effect ikat is known for. This item is out of stock, we can email you to let you know when it becomes available, by letting us collect you name and email below for this one off purpose. Check out our Privacy Notice for full details.